History of Screen Printing For Your Knowledge Today, as well see screen printing, it seems more like a modern marvel. Today, it is coupled with computer-based design, commercial electric screen printing machines, special inks, dryers, UV lights etc for dramatic effects. However, in reality screen printing has a long history to tell. It has evolved numerous times through the ages as people in old times tried to decorate various products and material. Hence, today, we are going to discuss on the history of evolution of screen printing. Today, as well see screen printing, it seems more like a modern marvel. Today, it is coupled with computer-based design, commercial electric screen printing machines, special inks, dryers, UV lights etc for dramatic effects. However, in reality screen printing has a long history to tell. It has evolved numerous times through the ages as people in old times tried to decorate various products and material. Hence, today, we are going to discuss on the history of evolution of screen printing. Some researchers believe that screen printing may have its origins back to the dawn of mankind. It is that time when men began creating images on the cave walls using stencils. Researches believed that early men already figured out innovative ways to apply paint on the wall using cut stencils. As technology evolved since then, people began creating better stencils to apply images to a myriad of surfaces and fabric. During the middle ages, stencil painting was used to decorate everything from wallpaper to playing cards and other wooden surfaces. This method of applying paint on a surface using a stencil has today evolved to become one of the most successful and efficient printing technique known as screen printing. The modern day stenciling started around 900 AD in China and Japan when silk screen were used in printing. Silk was used only as a medium of stenciling where silk was stretches between paper stencils and ink was forced through the silk stencil using brushes. The modern day screen printing technique can be traced back and credited to Samuel Simon who practically revolutionized this dormant art of screen printing. However, he used a brush instead of a squeeze to force ink through the mesh. He revolutionized it by creating his own silk screen stencils to reproduce images faster on the substrate. By the time Englishman Samuel Simon was developing his own screen printing technique, American printers were also looking at similar ways to create images faster, easily and precisely. He was an English. During those times, patents related to screen printing were being filed at a rapid pace. Printers also started using photo-emulsions to create hardened stencils on screens. Modern printers soon discovered that they could create multi-colored prints using screen printing and they started developing even more. Soon screen printing was used for almost all types of printing and become the choice of printing for posters being used for movie ads. By World War II, it was being used for military t-shirts, tanks and everything in-between. The current scenario of screen printing is the result of the revolution that took hold during the 60s. Many artists such as Andy Warhol gave screen printing a meaning and made it popular among the pop culture. During that time a rotary machine was also in the making which was developed to print bowling shirts. It was later discovered that the machine could be used to create images on any substrate, which was a ground-breaking finding of the time. Many companies even bought licenses to the technology and from then it became global. Since the modernization of screen printing, it has come a long way and became what it is today pretty fast. For example, implementation of computer technology, automated press, special effect ink, flash units etc took only a decade or two to develop. Plus the world-wide adaptation of tools such as t-shirt design software become faster than we thought. And most importantly, it is still evolving. We just have to wait and watch what future holds for screen printing. Very informative article. 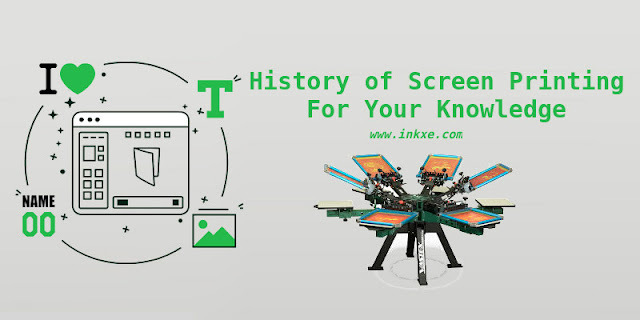 Here you have write the complete History of Screen Printing For Your Knowledge.